The other day I realized with a start that I am halfway through my working life. Although I’ll garden and putter long after I’m retired – I’m aiming to become a leathery, ageless peasant – I realized that I will turn 65 in 22 years, and that I left college 22 years ago. Like most people my age, I’ve had a lot of jobs. The one I hold now is a “real job,” and helps me believe that we can somehow pay for our daughter’s college education. I went through a long stretch of underemployment here in Vermont, so I don’t take this position lightly. But 22 years from now, I doubt that I’ll look back on individual moments at this job with much fondness. Too much of it takes place indoors, in conference rooms. Strangely, it’s moments from the lowest-paying jobs I’ve had that I remember most. I worked part-time at a bike shop the summer after I graduated from high school. I think I made $6.25 an hour, and worked about 20 hours a week. But I was amazed when I was given a key to the shop, a rite of passage that held more significance for me than did my church baptism at age 13. I’d arrive before my boss – he was far from a morning person – and I’d unlock the heavy white door, wheeling inside my blue Fuji, which had carried me over 20 miles of back roads from Strasburg to New Holland. The shop reeked of WD 40 and inner tubes. I’d lean my bike against the paneled wall, turn on the stereo that sat on a listing shelf in the tiny windowless office, and slip my boss’ cassette of The White Album into the tape deck. I’d roll the line of clearance bikes out into the parking lot as Paul went to the USSR, and made sure that I was back inside by the time the plane landed and faded into the gorgeousness of Dear Prudence. I’d work on the bikes, alone, as George’s guitar gently wept, and the auto-reverse deck changed direction and John told me, solemnly, that she is not a girl who misses much. I’d look out the window above the workbench at the dairy farm across the road, adjusting the bearings on a racing bike’s wheel, pleased at what I had learned. Trying on for size an unusual feeling: of competence, of satisfaction, of the sense that I would be OK. The other job with special meaning came right after we moved to Vermont, when I was 24. It was at a home for teenagers who were in state custody, and my job was to stay awake all night and make sure none of the kids escaped from the home. Although I kept the alarm system keypad with me at all times, the job was fairly routine, and my interactions with the kids mostly consisted of getting water for them when they woke with nightmares. Otherwise, the battle was simply in staying awake. I’d watch The Tonight Show, then Letterman, do the 15-minute crossword puzzle in the comically thin local paper, drink another cup of coffee, and open the fancy hardcover notebook I’d bought in Lancaster, before we moved to our cabin in the woods. I’d write for hours, until my fingers cramped, until I had to pee, until it was again time to walk around the house, unbeeping the doors, cracking them open to make sure the kids were breathing soft and steady – the boys’ rooms greeting me with a nose-wrinkling odor of socks and something jungly and unmentionable – and then re-setting the alarm with the keypad once more, to walk back upstairs to my notebook and my Sheaffer pen and keep going. Writing as if my life depended on it, as if this act of spilling ink in orderly rows would lead me to a future I could not yet name, but where I would be happier than I had been in Pennsylvania. Sometimes I would stop writing, and slow my obsessive search for my future self. I’d look at the moonlight reflected off the humped forms of snowdrifts, more snow than I had ever seen in my life, and that same bike-shop feeling would come over me, of rightness, of peace. 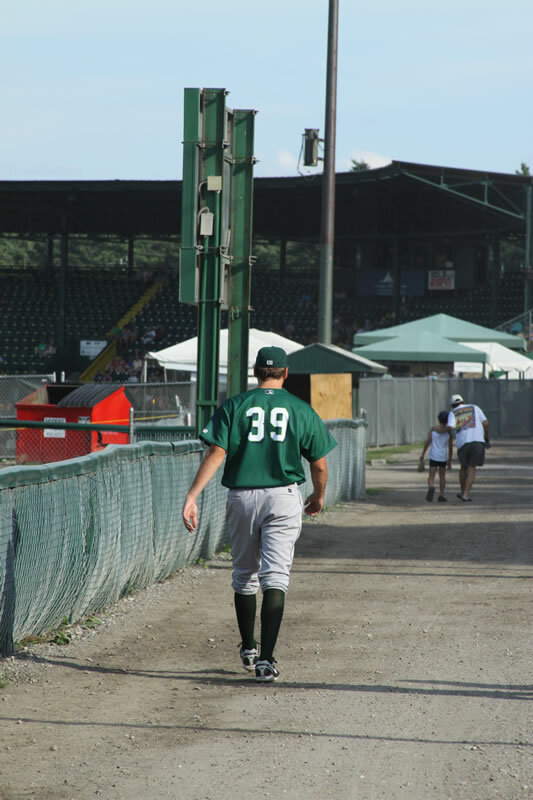 I ended my minor league sojourn last year with a trip to Burlington to see the Vermont Lake Monsters before September came and brought the Single-A season to a close. 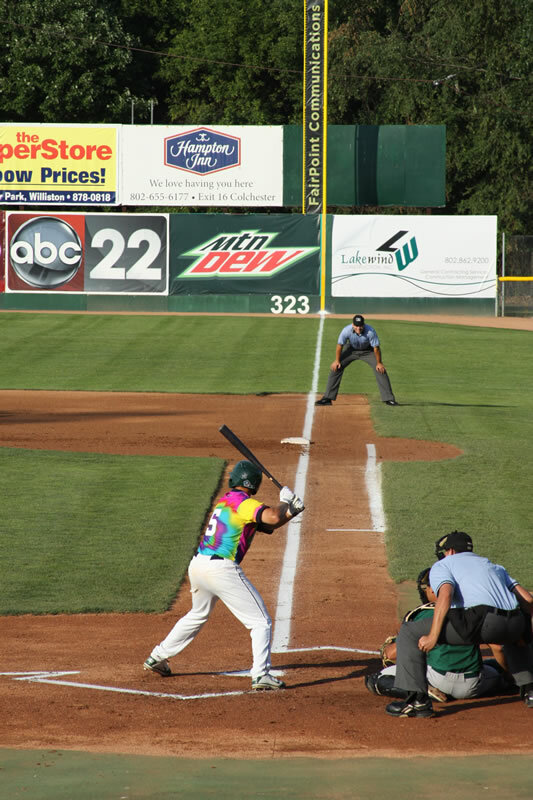 Aside from the creaky charms of the oldest ballpark in professional baseball, one of the things I liked the most about the Lake Monsters was that their park is a 75-minute drive from our house. That’s close enough to decide to take in a game on a whim, which is what I did on this humid Saturday evening, a month past the summer solstice. It would be difficult for a professional sporting contest to have less hype than do Lake Monsters games. Parking is free on the campus of the University of Vermont, and the ballpark is tucked into a residential neighborhood, hidden behind white-clapboarded houses like an elementary school. Sure, they play loud rock music before the games, and they have a green-suited mascot, and the PA barks out the names of sponsors and introduces the between-innings contests with the enthusiasm of a carnival barker. But the players walk to the field along a crushed-stone driveway, carrying their bats over their shoulders. They stretch and mingle with the fans in the picnic area along the third base line, seeming more like sons and older brothers than heroes or idols. After the stretching and throwing and wind sprints, the Latin guys sit on the rolled-up tarp beside the makeshift bullpen, chatting in Caribbean Spanish, spitting sunflower seeds, watching their starting pitcher work up a sweat, saving the trip to the dugout for ten minutes before the national anthem, because it’s nicer here out in the sun, and the dugout is a dank concrete-block affair, and there is no clubhouse, no row of canvas-backed chairs, no lockers, no workout rooms, no television or massage tables. That will all have to wait for other steps up the ladder: for Midland, for Sacramento, for Oakland. For now, it’s just about the summer night, and guys your age who speak your language, and a little white ball and a wooden bat and a leather glove. Lo mismo juego que en la isla. I was happy to take lots of photos of the Dominican players, to eavesdrop on their conversation, and then, after the national anthem, to find my solitary seat between the visiting dugout and home plate in Section A, which looked right down the first-base line, an eight-dollar seat with a hundred-dollar view. Like at Scranton in May, like at Portland a year earlier, my breathing slowed, and my heart – amped by minor crises at work all week – fell to its normal resting pace, then went 10 beats per minute slower. These short-season Single A games carry my Forrest Gump philosophy of baseball to an extreme: you *really* never know what you’re going to get. They can devolve into embarrassing error-fests, with pitchers throwing their gloves into the dugout after getting lifted following three straight walks, and managers seething on the cleat-torn grass at the utter ineptitude of their charges. Or, you can get a game like this: excellent pitching, no errors, three hits for the visitors, two hits for Vermont by the middle of the fifth. The yellow digital clock in center field reading 7:25, more than halfway through a game that started at 6:05. The place got loud when Vermont hit a homer to get on the scoreboard in the bottom of the fifth. Although there are lots of families with babies at the Burlington games, and gangs of pre-teen kids run around happily, unsupervised, people pay more attention to the contest here than they do in Manchester. There seems to be a higher percentage of lifers here, guys who look like they never miss a game, and I wondered again about what it would be like to live in Burlington, to ride my bike to the games after dinner, and be home in time to tuck the kid into bed. Jamestown took a 2-1 lead on a bad-hop grounder up the middle. And then Vermont rallied to tie the score, 2-2, in the bottom of the 7th. The crowd cheered every hit with gusto, and crowds of kids clapped in unison, pleased that they could get everybody else chanting along. 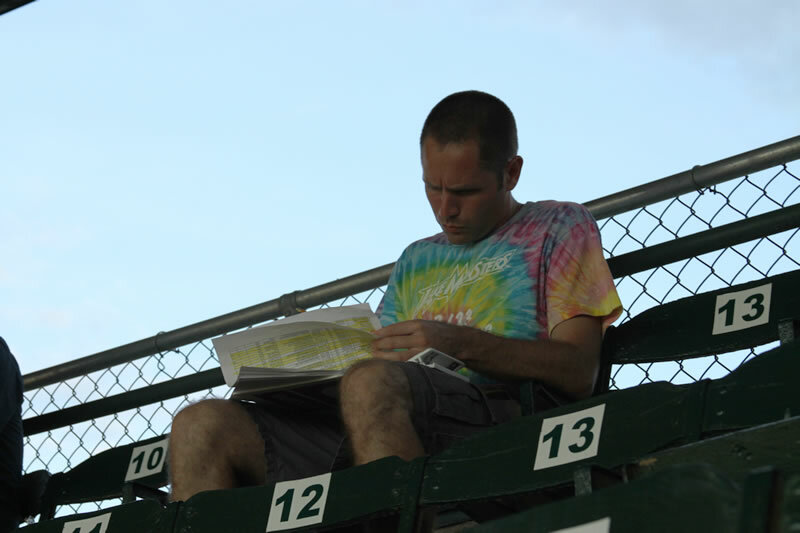 At the top of eighth, a guy about my age climbed up the stands, wearing a team-issued tie-dyed shirt (it was “Summer of Love” night; this is the minor leagues, this is Vermont). I watched him settle in the top row of ancient wooden seats, flip open a pad of paper, and begin working with a pencil. I realized after a few minutes that he worked for the Lake Monsters’ office, that he was probably balancing the books, or adjusting the statistics, and that he was finishing up a day that almost certainly began before noon. Although working for a minor league club might seem like heaven for a lifer like me, I’m sure there’s a lot of drudgery to it. Are there enough hot dogs? Do we need to order more cups? The blower for the bouncy-house is on the fritz; can someone fix it? At the bike shop, I had to work on beater Schwinns ridden by conservative “Martinite” Mennonites, whose bike frames and spokes and freewheels were inundated with dried cowshit, flung there by the tires as the Martinites rode from farm to farm. I was tired all of the time at the youth home. I drank too much coffee and worried about falling asleep on the 45-minute ride home to bed at six o’clock in the morning, after the sun came up and normal people were just beginning their day. But I’m sure that sitting in a quiet part of the stands and doing the books is something this guy enjoys more than almost anything, that this is what he looks forward to when he heads off to work at 11 in the morning, to begin his long day. Jamestown’s side-arming left-handed reliever walked in the go-ahead run in the bottom of the eighth, and the place went nuts. I moved to stand along the concrete risers beyond the third-base dugout, waiting for the Vermont closer to nail down the win in the top of the ninth. Once he did, I sprinted for the crushed-stone driveway, beating the crowd to the exit, and I was walking across the UVM campus at 8:20, calling my wife on the mobile, headed for our car. “It’s over already?” she said. “Even better than Scranton?” she said. I drove the 75 minutes home, listening to the Red Sox, thinking about the accountant just now riding his bike across Burlington, the light towers of Centennial Field finally dark behind him. He enters the front door of their apartment. His wife is still awake, surprised the game is already over. There daughter is asleep. She’s only five years old, young enough that he doesn’t need to worry too much about how he’s going to pay for her college tuition. Not yet. He’ll have to figure that out someday. This isn’t a *real* job after all, working for the Lake Monsters. It pays peanuts. But the next night, he gets to see a minor league baseball game, and sit high up in those quiet seats in the eighth inning. And the next night as well. All the way into September. good stuff. i remember that fuji.